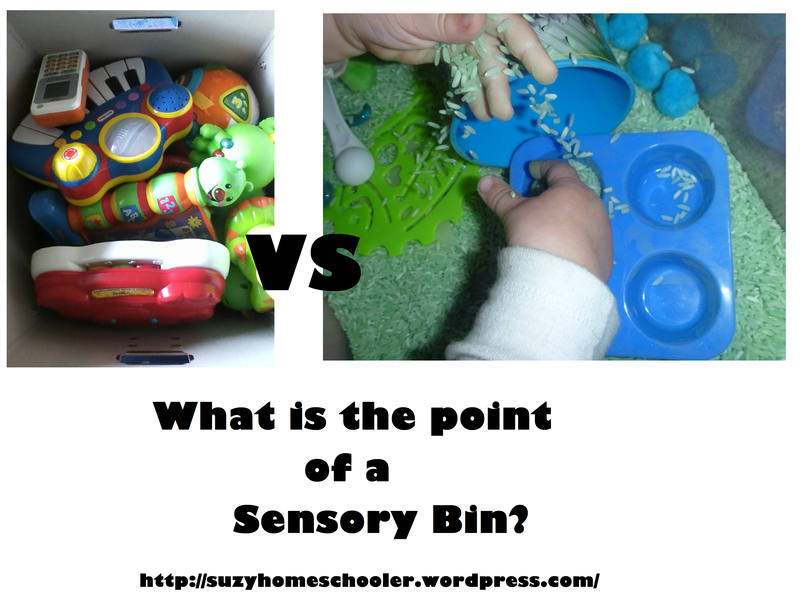 You are here: Suzy Homeschooler » Why Sensory Play » What is the Point of a Sensory Bin? Sure, sensory bins are fantastic for fine motor practice. They can be an excellent means of introducing or reviewing a specific subject, such as butterflies or kangaroos. A sensory bin can be a wonderful way to bring a book to life for a child. If you are an imaginative person then making sensory bins for your children can be a fun creative outlet, as it is for my husband and I.
Sensory bins are also a means of getting all the benefits of sensory play (language development, concentration, confidence, etc..) without having to clean up a huge mess! Because the aspects of the play are generally confined to the bin, clean up is a breeze! But what it all boils down to, at least in my opinion, is that a sensory bin is a safe and easy way to supplement open-ended play and sensory exploration into your child’s life- two things which children in this day are especially lacking. Think back to your childhood. Take a moment to reflect on how much time you spent outside playing. Recall the objects with which you played most happily. Chances are, if you compared your childhood to that of your children’s, you would see a dramatic difference in when, where, and how play occurs. The same could be said if you compared your childhood with that of your parents, or if you were to compare your parents’ childhood with that of your grandparents. Our society has changed a lot in this past century. In many ways we are better for it. In other ways, we are causing horrible damage to ourselves and to future generations. We don’t have to trust the anecdotal evidence of each generations’ childhood compared, there are numerous studies which have shown without doubt that our children are spending less time playing and they are suffering for it. There is a rise in depression and anxiety in American children, which many healthcare workers attribute to lack of play. Beyond this, new illnesses have sprouted from this change in our society, such as Nature Deficit Disorder. Sensory Processing Disorder (SPD) is another complex condition which, while we are unsure of the exact cause, many believe is on the rise due to environmental factors. A child genetically prone to SPD in the 1920s might have been fine but that same child in 2013 may suffer chronically. America’s schools have been ranked the lowly number of 17 [out of 40 developed countries] and our nation’s leaders think that in order to claw our way back to the top of that chart we must have our children spend more time in school. School starts at a younger age, hours last longer. What our nation’s leaders are failing to understand is that by forcing children to spend more time in school, we are taking away the crucial time that should be spent learning through self directed play, as is developmentally appropriate. Maria Montessori, Karl Groos, Albert Einstein, Pablo Picasso, and countless other intelligent, successful persons all came to the same conclusion in their work: play is necessary to the emotional, mental, and physical growth of a child. Play is not a frivolous way for children to spend their time, play time is not worth less than school time. Play is necessary to children’s growth and development. It is unfortunate that not only are our children loosing playtime to start school younger and spend more hours in school per day, but they are also loosing playtime for homework assignments, despite the fact that homework before middle school is generally counter productive. We live in a country that places more value on a child who can read at age 3 than it places on a child who has taught themselves to quietly observe and study their surroundings by watching squirrels gather nuts for the winter in their own backyard. As a direct result of this, our children spend less time having unstructured play, and more time being drilled with flashcards. Take a minute to walk through your child’s bedroom and mentally tally-up toys based on the materials they are made of. The vast majority of Americans would be hard-pressed to find a toy not made of plastic in their child’s room. Looking at the trends of popular toys over the past 100 years, we see a definite shift from real materials, such as the wool of Raggedy Ann’s hair and the wood of Tinker Toys, to plastic everything. We also see play becoming less and less self-directed as the toys now tell the child how to play, such is the case with video games and even battery-operated stuffed animals, like Tickle Me Elmo. So what does all this have to do with sensory bins? When a child plays with a sensory bin, they are playing with a variety materials and textures which stimulate the mind beyond what plastic alone can achieve. There are no rules about how to play with a sensory bin, it is self-directed learning. Short answer, what is the point of a sensory bin? Are sensory bins the magical answer to the problem? No, of course not. Sensory bins are just one of the many tools that parents and educators can use. If you or your child do not like sensory bins then thats ok, there are other options for open-ended, child-led play which engages the senses. That said, if you’re looking to supplement your child’s play in a way that will help them develop focus, expand vocabulary, engage their mind through the senses, improve fine motor skills, boost confidence, etc.. then a sensory bin is an easy way to do all of that and more. As I said above, my own post Sensory Bin 101 breaks down how to make a sensory bin if you’re not sure where to start. Also, if you’re looking for ideas for sensory bins, I’d like to direct you to my own sensory bins for inspiration, as well as Little Bins for Little Hands. Little Bins for Little Hands is a site full of sensory play ideas written from the perspective of a mother with a child who has sensory processing disorder and is on the autism spectrum, her ideas are inspirational. Finally, if you want a more in-depth look at sensory bins, then I’ve heard great things about Sensory Bins, the What, the How, and the Why by Sharla Kostelyk. This ebook has nothing but positive reviews and is only $2.99! If you have any comments, questions, concerns about this or any other topic featured on my blog, please feel free to leave a comment or shoot me an email. I love to hear your thoughts. 23 Comments to What is the Point of a Sensory Bin? I think this is an excellent article on the important of sensory play. I have seen how important this is and how children react to sensory bins. They are an amazing thing that for the longest time i knew nothing about. Sensory bins still aren’t as main-stream as they could be. It would be nice if there was a little paragraph in “What to expect baby’s first year” about the importance of child led sensory exploration, or if doctors handed out a pamphlet on the subject at the 6 month wellness exam. An important post! My daughter loves sensory bins and I know they’re beneficial, but I’m never ever to put into words why. This post has been helpful! Thank you, Emma. It is a topic that I feel very passionately about and I know from reading your blog that you too have seen first hand the benefits of sensory play for your children. Great post! I always get asked WHY too, I love your detailed answer! We are BIG on sensory play at our house! Great article! Thanks- I’ve been doing Montessori activities with my toddler for awhile, but have stayed away from sensory bins until just last week. I was so impressed with how excited she was with some beans and cheap Halloween toys! Our first bin was simply rice and felt- things we had sitting around the house. Isn’t it amazing how happy these simple things make them? Great post! I used sensory play as a teacher and now as a parent , in so many ways because it has so many benefits, plus it is fun! Thank you for this post! Very clear and concise explanations and tons of fantastic ideas! New follower, liker and pinner!!! what a detailed post! Thank you for sharing on sensory smart Saturday! what are the best ages for sensory bins? how old is to old, and how young is to young? Great question. I think a great starting age is around the time that a child can sit up unsupported and perhaps be on the verge of learning to crawl. So somewhere between 6 and 8 months old. Just be sure that anything included in the bin is baby safe. No small parts until they get to be older. They can probably manage a base like rice or beans under adult supervision sometime between 18 months and 2 years, but a parent will know if their individual child isn’t ready yet. As for “too old,” I have yet to experience a child claiming to be “too old” for sensory bin play. Recently I hosted a party for the neighborhood children (ranging in age from 2 years to 12 years) and every child at the party played with the provided sensory bins. My 1st grade son still regularly plays with sensory bins, though he isn’t an entertained by them as he was a couple years ago, they still keep his interest for an hour once or twice a week. I guess I would consider a child “too old” when they vocalized that they were no longer interested in sensory play. This will likely vary from child to child. Great post and just what I was looking for. Linking to it in a post I am doing. Thanks much. p.s. I agree completely with your info on the importance of play.